Nonfat Greek yogurt with raspberry purée and lemon curd, topped with granola. plain nonfat greek yogurt (cultured grade a nonfat milk [contains active yogurt cultures]), raspberry puree (raspberries, sugar, water, tapioca starch, pectin, red cabbage extract for color, lemon juice concentrate, locust bean gum, natural flavor), oat and honey granola (whole rolled oats, milled cane sugar, rice flour, oat flour, vegetable oil [canola and/or safflower and/or sunflower oil], molasses, honey, natural flavor, salt, barley malt syrup), lemon curd (sugar, egg yolks, water, butter, lemon juice concentrate, modified food starch, natural flavor, salt). Breakfast time, snack time, anytime. 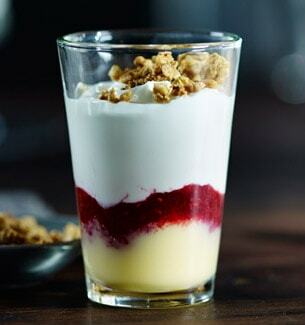 The sweet raspberry purée and honeyed granola offer a delightful contrast to the tangy lemon curd and Greek yogurt. Simply grab a spoon and go. Lemon curd originated in England in the late 1800s.